Houston's semi-tropical climate ia a perfect breeding ground for insects including tons of cockroaches. Cockroaches can enter your home from outdoors via cracks, crevices, and tiny openings. They can hitch-hike inside grocery bags, furniture, packaging - virtually anything. Your home offers the perfect cockroach nesting site: Food, water, shelter and ample hiding places to raise a very big family. Cockroaches are prolific and populations can explode almost overnight. One German roach egg can hatch out more than 32 cockroaches - in just 30 days. Seeing one cockroach in your home can mean many more roaches in hiding - reproducing in walls and voids. Cockroaches are basically shy and primarily night creatures. But they can be stressed out into daytime activity due to over population of their choice harborage. So, if you see one cockroach in the daytime, you could have a serious infestation already. Some people are allergic to the presence of cockroaches and react to their feces and cast skins. 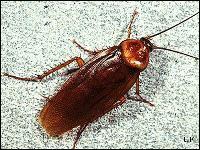 Roaches are unsanitary creatures and can cause health issues. Cockroaches are one of the toughest pests to handle on your own. Many eggs, many hiding places - and some not so obvious. Without professional know-how, specialized equipment, and advanced materials, the cockroaches have the distinct advantage. Somewhat aggressive. Reported to nibble on fingernails and eyelashes of sleeping sailors on infested ships. Capable of considerable flight although mostly a short glide after being disturbed. Prefers warm, damp areas including storm sewers and drains. Visits homes, restaurants, and commercial facilities. Scavenger; eats what we eat plus glue, soap, paper, garbage - practically anything. A female may produce many egg capsules after only one mating and may produce capsules approximately every 4 days.The maximum number of capsules recorded by one female was 90. Each American egg capsule contains 13-16 eggs. Capsules are often glued to surfaces in hidden areas. These roaches reach sexual maturity in about 7 months. This roach has a special affinity for yeasty alcoholic beverages - no particular brand. Adult German roaches are slender and 1/2 to 5/8 inch long. They're light brown to tan with a distinctive head shield bearing two dark parallel bars. This roach is the most common cockroach in the U. S. and the most prolific. Active mostly at night, it commonly infests kitchens and bathrooms but can spread quickly throughout the entire premises. The most common species found in apartment and commercial facilities. German roaches don't migrate from outside but sneak a ride into homes and business inside something brought in. Or in the case of apartments and condos, they may enter from neighboring units via common plumbing or utilities. Scavenger; eats what we eat plus tooth paste, soap, glue, pet food - nearly anything. Each German egg capsule can hatch out to 30-40 baby roaches - in just one month. Hatchlings can become sexually mature adults in only 5 weeks. Adult lifespan can be up to one year. Allergies have been associated with the presence of German cockroaches. Cockroaches can carry diseases including Salmonella. This species of cockroach is capable of producing the most severe cockroach infestation in just a few weeks. Reddish brown to black and about 1 to 1 1/4 inch long. This cockroach prefers sewers and commercial buildings where they can become numerous especially in damp areas of crawl spaces and drains. A common exterior roach found in leaf litter and ground covers, they can however build to large numbers in secluded, damp areas of homes and buildings. Each female cockroach produces about eight egg capsules containing 16 eggs. Nymphs become adults after 10 molts over 200-800 days dependent on temperature. Adults lifespan can be up to six months. Produces a considerably unpleasant, pungent cockroach odor. Seems to tolerate cold weather more so than other species. Adults are about 1/2-inch long. Light to medium brown color with two yellow-brown lines running across their bodies. As with all roaches - they work the night shift. This species prefers a drier environment than many roaches and will scatter throughout the home migrating to hiding places such as in ceiling moldings, furniture, pictures, appliances and TVs. Since they're not nesting in normal cockroach harborages, it makes for more challenging treatments. Scavenger - no particular preferences - eats nearly anything. Females produce around 14 egg capules each containing between 14-18 eggs. After carrying the egg capsule for only a few hours, the female glues the egg capsule in a hidden area often inside appliances or under some protected area. Nymphs hatch in about 70 days reaching adult status between 90 - 276 days. Adults live about 6-10 months. The brown-banded roach and the German roach look simular but can be distinguished by their distinctive band markings. This species requires less moisture than other species. Roach Fact: One egg can hatch to 40 new baby roaches in just 30 days. Schedule service today! Cockroaches - 13 Tidbits You Likely Do Not Know. Protex Pest Control - Houston Roach Control Experts since 1978.